A high-speed chase has ended, but a manhunt continues in southern Utah. 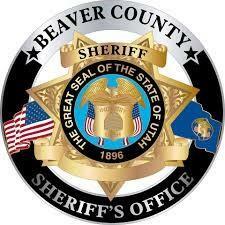 The Beaver County Sheriff’s Office received a request for assistance from dispatchers in Richfield just after 4 a.m., Tuesday morning. Authorities in Beaver responded with spike strips and brought the stolen SUV to a stop on I-15 just north of Beaver. Two suspects were apprehended, but a third fled into the darkness and remains at large. Officers from Beaver, UHP, Iron County, Cedar City, and a Department of Public Safety helicopter are searching for a white male in his late 20s to early 30s, short brown hair, tattoos and a beard. The suspect also has large gauges in both ear lobes and was last seen wearing a blue sweater, jeans and black shoes. He is considered armed and dangerous.